DETAILS Valentines Day isn’t just about ASKING, it’s also about Telling those you love how much you love them. This project is perfect for that. Cut a 20” long by 5” wide strip of red paper. Mark 4 inches for the first fold and accordion fold the rest into equal segments. 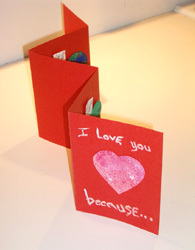 Cut out five different hearts to glue into the five sections. Leave the upper part of the hearts open and tuck in love messages written on slips of paper. Decorate the front with a heart and the message -- I LOVE YOU BECAUSE...the notes will tell why. Here is a perfect place to use creative papers you have designed. Alternatively, use wrapping paper, pictures from magazines or decorate your hearts with crayons, markers, paint and even glitter. Use your imagination. MATERIALS NEEDED Colored paper, scissors, glue, pen. ruler. Optional: wrapping paper, magazines, glitter, crayons, markers. SKILLS NEEDED Ability with scissors and some manual dexterity for folding and gluing.